One of the best ways to get kids to exercise is by finding ways to get them active without making it feel like actual exercise. 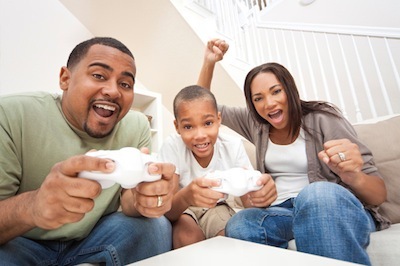 Thanks to video games and computers, today’s kids live a more sedentary life, so it is more important than ever to get them moving whenever possible. From fun games to trampoline tricks and even yoga, here are 10 steps you can take to get your kids to play hard and thus get exercise without even knowing it! Even though these are exercises in the sense that they increase muscle strength, burn calories and get your heart pumping, sports and exercise mental-skills coach Carrie Cheadle, M.A., advises against calling them exercises — at least to your kids! Dziewisz advises setting up three orange cones and shuffling back and forth between them. Or follow these easy steps from Simple Kids to create your own backyard obstacle course using cones. Using hula-hoops is a great way to build kids’ core strength while working on coordination and rhythm — and having a ball! “Try hula-hooping with your kids for exercise after school,” says Andrea Metcalf, author of Naked Fitness. “That’s the time that energy is lowest for everyone due to the circadian rhythms of light/night hormones. 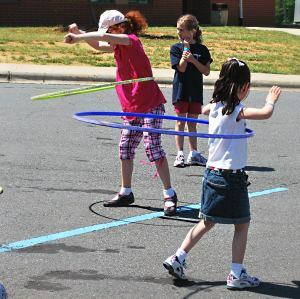 Hula-hooping is fun and easy if you have a hoop the right size,” says Metcalf, who recommends getting a smaller-sized hula-hoop for the kids and one that weighs about one pound for yourself so you can sneak in some extra exercise, too. 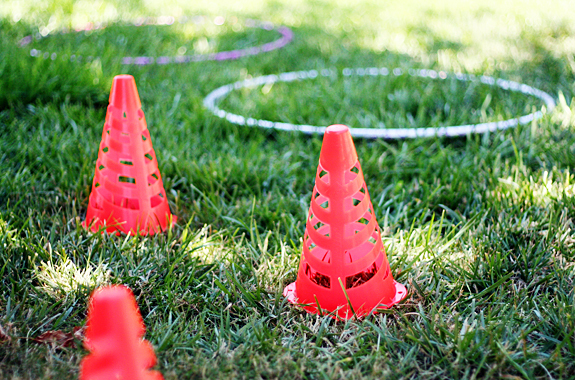 Perfect-Parties.com has tons of fun outdoor game ideas incorporating hula-hoops and beyond! You can get a workout in during this time by helping your little ones through the equipment. 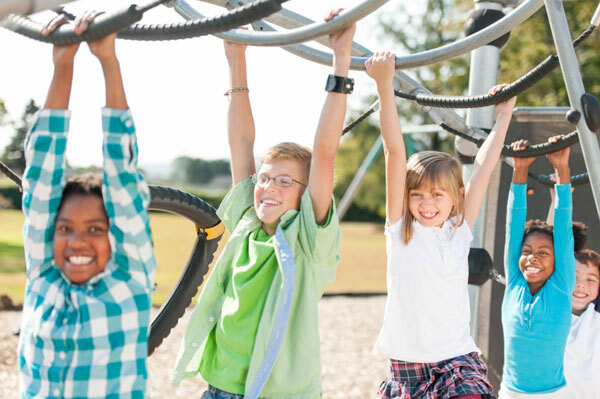 Check out Live Well Network for more tips on making your playground time count for your sweat session, too! Did you know that just 10 minutes of jumping on a trampoline can equal the health benefits of running for half an hour! “Jumping is key to a child’s mental and physical development and helps to accelerate the progress of motor skills, balance and coordination,” says Beth Wilkinson of Springfree Trampoline. Seat drops: Jump up and pull your legs straight in front you, parallel to the mat. Land seated on the mat and rebound back up to a standing position so that you’re ready to jump up and repeat in a continuous motion. Knee lifts: As you jump up, pull your knees up to your chest and try to touch your feet. This move helps tone your lower-body muscles. Starfish: As you jump up, quickly extend your legs and arms horizontally into a starfish position. Pull your legs and arms back in to return to the mat in the basic jump position. Yoga is not only great for adults but for kids as well. It strengthens their muscles, improves core strength and increases balance, agility and coordination. Anna Weeks, a yoga instructor who heads up a kids’ program, says that one of the popular poses for kids is the Simhasana or Lion Pose. “For the kids’ class, we have everyone sit on their heels and place their hands on their thighs. Sitting up tall, we take a big inhale and then ‘roar,’ sticking the tongue out. After a few rounds, we hold the pose with the tongue out, looking up in between the eyebrows,” she explains. For more yoga fun, break out the Twister game. “Twister is yoga in disguise,” says fitness business owner Grant Hill. FamilyFun magazine, which publishes a “Get Active” feature in every issue, suggests building a hurdle set to get your kids jumping. “With PVC pipe fittings and colorful tape, you can build a set of three hurdles for less than $15. 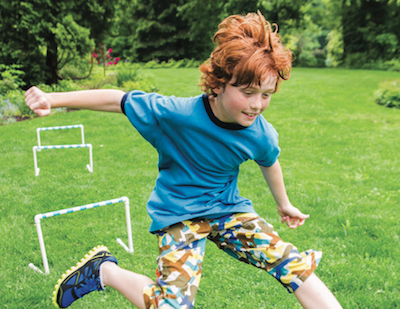 Jumping over and crawling through the hurdles will help your kids improve their agility, and they can use them as goals for backyard ballgames,” says the magazine. In addition to hurdle jumping, FamilyFun advises using an exercise ball for some fun, kid-friendly activities. A big, bouncy exercise ball makes even the work of getting fit seem fun. Kids as young as 5 can reap the benefits, according to New York City–based kids’ fitness expert Steve Ettinger. The balls naturally lend themselves to playful movement while improving balance, strength and stability. You’ll want to get a ball sized so that your child can sit on it with her feet on the floor and her knees and hips at 90-degree angles. It doesn’t have to be a perfectly sunshiny day to sneak some kid-friendly exercise into your day. 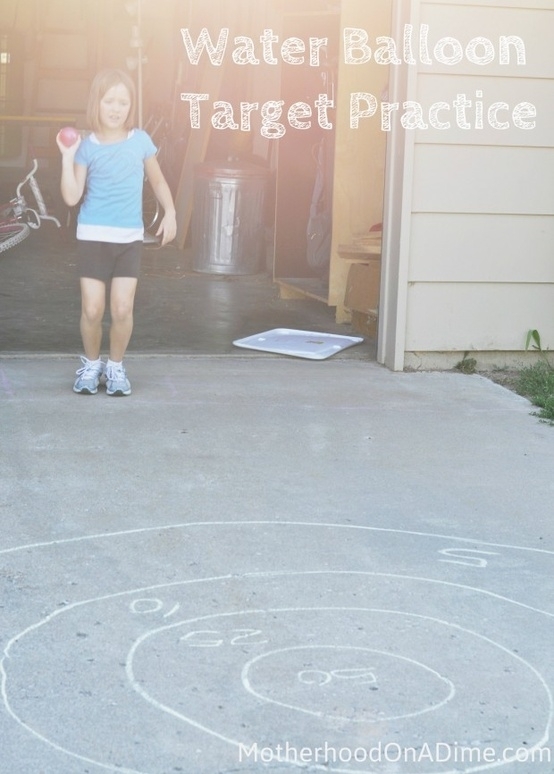 Take a cue from No Time for Flash Cards and create an active game that can be done indoors or out. 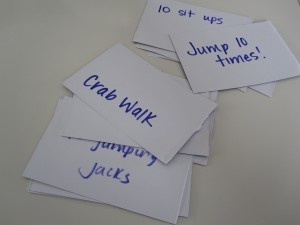 Simply write some fun activities (such as crab crawling or karate kicks) on note cards (one activity per card) and then flip them over with your kids and demonstrate the action written on each card. Kids love balloons, and there are so many active games they can play with them.